Floating on Henley-on-Thames, about 35 miles west of London, is an elegant wood-hulled riverboat designed by Frank Stephenson, design director of Britain’s McLaren Automotive best known for his revivals of the bobber-size Mini Cooper and Fiat 500. The 31-footer, called Riverbreeze, takes her name from her extremely smooth and silent navigation thanks to the electric propulsion sistem. Stephenson, well used to the high-decibel rumbles of powerful cars he designs, wanted a much calmer atmosphere for his personal riverboat. “When I get on the boat, all I want to hear is the birds and the water” here’s how he wishes his onboard experience to be, chilling in peace with nature, perhaps smoking a pipe or enjoying a drink. 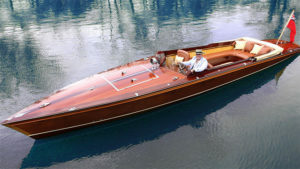 The sleek-lined boat is a classy combination of rosewood and mahogany from Africa and Brazil, laid up with fifteen layers of laquer when it was built and another five every year (which makes a total of 35 coats of protection by now). The choice of wood Stephenson shares with many other passionate designers, among which Frank Gehry with his Foggy sailboat, is a sort of a romantic one. A sort of rumble seat up front opens via flip-up portals, a bit like the dihedral doors on the Stephenson-designed McLaren 650S and 570S. Up front on the prow there’s a mermaid hood ornament from a 1932 Cadillac, a nod to the designer’s work on land that matches with the theme of times gone by. Riverbreeze is powered by a “torpedo-shaped” 4.2-kilowatt electric pod motor juiced by eight Varta 12-volt marine batteries that take about eight hours to charge. That adds up to 14.7 kilowatt-hours of storage, enough to get Stephenson and company from his home at Henley-on-Thames to the Cotswolds about ten hours away, and back. Charging points all along the river mean he doesn’t need to sweat range, though. Plus, the benefit to traveling on a river is that at least one direction could be simply floating, if necessary.